A blog for my various projects. The Microsoft Natural Keyboard 4000 is pretty great, but the "Zoom" slider in the middle never seemed very useful to me - how often do I need to zoom in or out? I scroll much more often than I need to zoom, so it would be nice to remap to scroll instead. 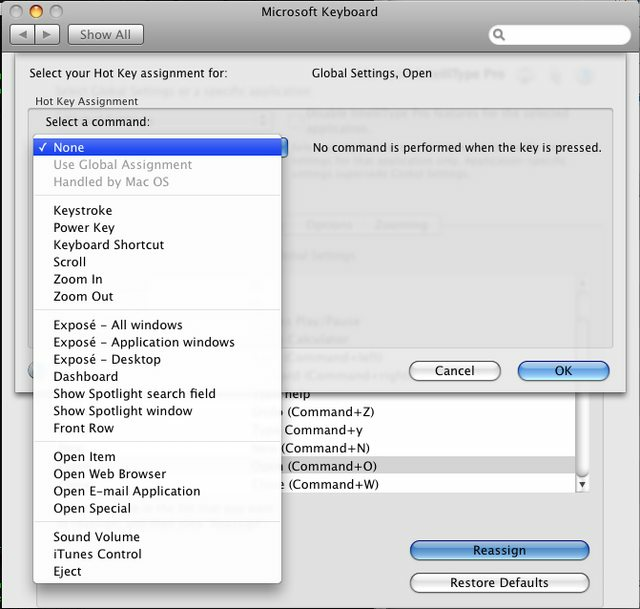 Although Microsoft's control panel lets you remap the special function keys, it doesn't let you change the Zoom slider function. Luckily for Windows users there's a fairly simple xml file that you can edit to change the mapping (and there are plenty of explanations: SuperUser, Josh Highland, Joel Bennett, etc). After a bit of reverse-engineering, I was able to remap the Zoom slider to the UP and DOWN keys (sadly, using the SCROLL mapping doesn't auto-repeat, so UP/DOWN was the best I could do). Now we'll make some key mapping changes and see what parts of the pref file change. I changed the Open and Close buttons to do nothing. It looks like the 0xff signifies "None" mode, whereas the 0x54 and 0x55 probably specified the Open and Close functions that used to be there. At 0x0000b86, value 0x5500000000 changes to 0x09000000ff. The next issue is figuring out which bytes correspond to the Zoom slider's key-mappings. The only control that the GUI provides is enable/disable, zoom speed, and zoom acceleration, so we can mess with those. 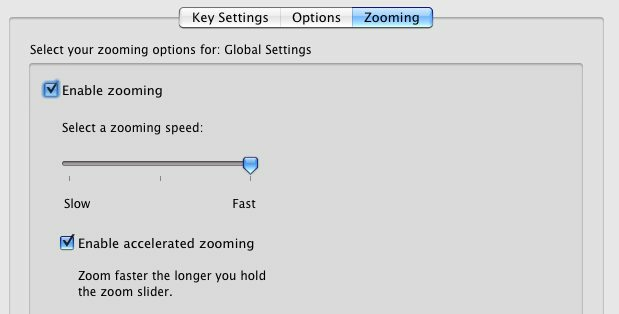 So it looks like disabling zooming is actually just switching 2 key mappings to None (0x00000000ff) - and now we know where the key mappings for the Zoom buttons are located (0x51e and 0x546)! Now open the Microsoft Keyboard settings panel within System Preferences to get the driver to reload the pref file, and you're all done! It kernel panicked the first time, but works well now. Have you tried remapping the favorites buttons to next/previous song in iTunes? Didn't work for me, have the intellipro thing 8.2 and Mountain Lion. Pref pane seems to be the same even after moving, didn't see any different options and enabling the zoom silider still zooms instead of scrolling. Worked liked a charm with your instructions. Thanks. Is it possible to remap capslock for layout switch? Thank you very much for this! I just got this keyboard and desperately wanted to have the zoom keys swap between windows. Problem is, Intellipoint won't let you use the backtick as a keystroke (WTF?). Solved this by going to Keyboard Shortcuts… and changing the shortcut for "Change focus to next window" to be Ctrl-Opt-Cmd-[ (Open square bracket, to avoid conflicts). Then changed the hex as above to "03 00 00 19 21" and "03 00 00 1B 21".